In the silent pause as I returned to my seat after talking about adding bike parking requirements to the zoning ordinance under consideration at a Stevens Point Plan Commission meeting, I feared the commission members collectively figured that they let the bike guy have his say and would now return to the business of passing the ordinance and moving on. The Plan Commission was reviewing changes to its zoning ordinance about parking. Seventeen pages were filled with tables, diagrams, and dry zoning language describing how new developments should provide parking for all the motor vehicles that would be used to travel to such places. Buried in this document was a section entitled “Bicycle Parking”. For those of us who commonly pedal to our destinations, this was a refreshing inclusion. Unfortunately, this section was only about a quarter of a page long and vague enough to have almost no benefit. “Bicycle parking facilities shall be high-quality, inverted ‘U’ type construction.” Sounds good so far. “Alternative high-quality bicycle parking facilities may be approved if they can be shown to provide adequate theft protection.” Uh oh. To an adminstrator who never rides a bike, those wheel-bender bar racks available in catalogs from reputable bike rack manufacturers probably look high-quality enough to approve. 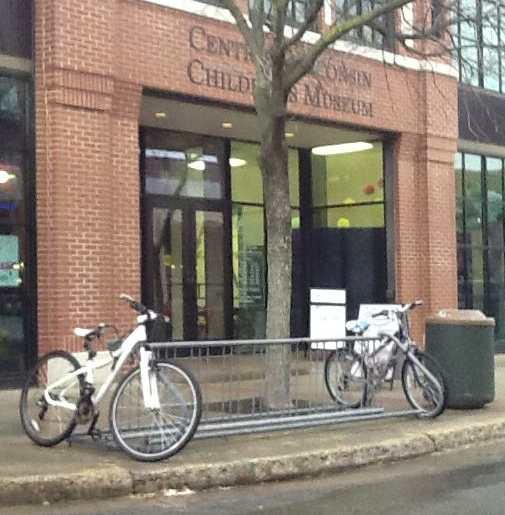 Furthermore, the ordinance had nothing about minimum spacings of bike racks from walls. And the 200 foot maximum distance to the main entrance seemed a lot farther than it should be. Bicycle riders need racks that support the bike and allow for securing the frame with a quality lock. Bar racks are extremely inefficient for these needs. I have encountered enough poorly placed bicycle parking to understand that changes to these proposed requirements were necessary. Unfortunately, I have no background in zoning. Although it is easy to identify grossly inadequate bike parking requirements, that doesn’t help with proposing a reasonable alternative. So what’s a bike advocate to do? Rewind to one week before that Plan Commission meeting when I first found out about the proposed ordinance and its section on bicycle parking. I discovered it as part of my regular scan of city meeting agendas. As soon as I realized that I needed help for proposing better bike parking language for the ordinance, I send out an e-mail to an ally also working to improve bicycling. She made additional inquiries and relayed information to me regarding a document about bicycle parking guidelines published by the Association of Pedestrian and Bicycle Professionals (APBP). Although the most recent version of this document requires a fee, the 2002 version can be downloaded from the APBP website for free. Upon reading the 8-page document, I realized that it contained the information needed to create meaningful language for bicycle parking requirements in a zoning ordinance. After preparing some notes based on the APBP document, I made my plans to attend the Plan Commission meeting and to speak when the opportunity for public comment arose. At the Plan Commission meeting, I listened to the deliberation on the zoning ordinance. The discussion among commission members included only one comment about the bicycle parking section, and that person spoke of the pragmatism of “baby steps”. Sigh. Finally, my opportunity to speak arrived. I started by discussing why the proposed bicycle parking requirements were inadequate. I gave a copy of the APBP document to the commission and made several suggestions of how to change the ordinance to create meaningful bicycle parking requirements. After a few minutes, I sat down and waited out the aforementioned silent pause. One commission member said they liked what I proposed. And another responded. And all of a sudden, the Plan Commission was talking about bike parking! It was as if the taboo of talking about bicycles as transportation vehicles was lifted and that it was actually OK to talk about bikes at the Plan Commission. This seems more important than the specific bike parking text in the zoning ordinance. After several more minutes of discussion, the Plan Commission decided to put off their vote for a month so they could draft a new version of the section on bicycle parking. Properly installed post and loop racks provide quality bicycle parking that meets the APBP guidelines. That Plan Commission meeting was in early November. I had some communication with the official responsible for the document, and after seeing the new draft and making a few more suggestions, the updated zoning ordinance containing all my suggestions was brought to the December Plan Commission meeting. 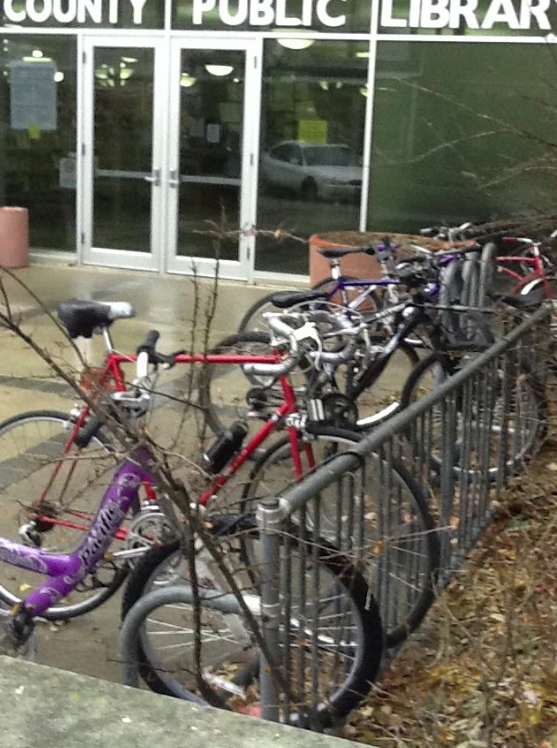 The updated ordinance had language lifted from the APBP document defining the qualities a bike rack should have. This language rules out wheel-bender bar racks and other abominations. The ordinance also adopted the APBP recommendations for minimum spacings between racks and separations from walls and other barriers. And the maximum distance between the rack area and the main entrance was reduced to the APBP guideline of 120 feet. These updates were substantial improvements over the original language from the November meeting. The Plan Commission passed the updated ordinance at their December meeting. I even received a mention of thanks for my efforts. Two weeks later, the Stevens Point Common Council approved the ordinance change. 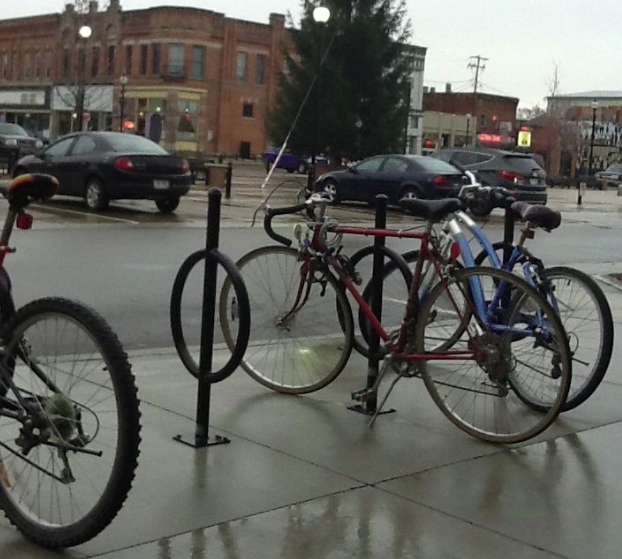 Stevens Point now has meaningful bicycle parking requirements for new developments. In the big picture of normalizing bicycling as a mode of transportation, this is a small step. Nevertheless, zoning ordinances are the nuts and bolts of how a city functions, and several small victories at this level can change the conversation about urban bicycling in a profound way. I wanted to share this story because I feel there is a lot that can be learned from it. Ordinary citizens working to improve bicycling can be heard by local officials. Opportunities arise by staying aware of what your municipality is considering. Quality advice from others who have already hurdled your obstacles is extremely valuable. Suggesting credible alternatives is far more effective than merely criticizing what is on the table. You may have more bicycle allies in your local government than you realize, yet their efforts to be bike friendly may be ineffective without your input. I hope my story provides inspiration to those who want to make bicycling better where they live. This entry was posted in Advocacy, All Posts, Infrastructure, Stevens Point Area. Bookmark the permalink.